- The round towers can be attached to the castle and stacked on top of one another to build a tower up to three stories high. Can be rotated 90° as desired. - In the round towers, there's room for the figures and the small animals. - The two-winged door can be opened forwards. 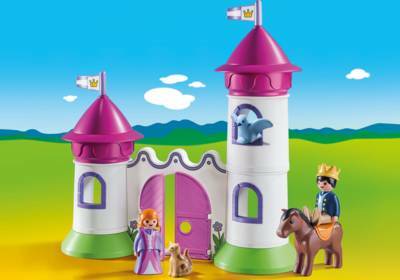 - The king can ride on the horse through the gate. - The female figure cannot sit down.